The Tunisian journalist union SNJT – a model for export to the Arab world? In 2009, the government launched a campaign against Syndicat National des Journalistes Tunisiens, or SNJT, after the latter began criticizing the government for restricting press freedom and harshly treating journalists. The campaign led to the ousting and sidelining of the legitimate and independently elected executive bureau and replacing it with a new bureau that was loyal to the president. Since the early days of the revolution, the SNJT emerged as a major actor on both the union and political landscape. Many signal events point to the new role the SNJT has successfully assumed on the local and regional levels. In May 2016, the syndicate hosted the 13th conference of the Federation of Arab Journalists, the biggest professional syndicate for Arab journalists. Typically hosted by the countries in the Arab Levant, this conference was the first to be held in North Africa since the federation was founded in 1964. The theme of the conference, convened in Tunis, was “No impunity for crimes against journalists,” a taboo topic in the Arab region. A year after the provocatively themed conference of the Federation of Arab Journalists, the International Federation of Journalists (IFJ) released the draft of a new international convention to protect journalists from the SNJT headquarters in Tunis on November 18, 2017. The IFJ also decided to convene its coming congress in mid-2019 in Tunisia under the aegis of the SNJT, another first for the Arab region and North Africa. The SNJT’s new role on the Arab and international scene contributed vitally to the political transformations seen in Tunisia over the last decade, since the syndicate become a major actor on the national political and media stage. To understand this, it is important to reach back to the five years leading up to the revolution, described as “years of struggle for legitimacy and a presence” by Najiba Hamrouni, the first woman to assume the presidency of a journalists’ syndicate in the Arab world. In the five years before the revolution, Tunisian journalists waged a long battle to win their demand to become a real syndicate, rejecting the role allotted to them by the regime of Zine al-Abidine Ben Ali, which wanted to contain them within an association whose role could be defined depending on its adherence to the regime’s red lines drawn by the regime. For a half-century, Tunisian journalists have waged numerous battles for their own independence and media freedom. The struggle reached its peak in the final years before the revolution under the rule of President Ben Ali, whose record is replete with the arrest and imprisonment of journalists and the closure of independent newspapers critical of the authorities. After the revolution, the transitional political authorities, with a push from the SNJT and civil society, adopted various pieces of interim legislation before the elections on October 23, 2011. These statutes gave greater protection to journalists, prohibited imprisonment in publication crimes, and allowed the free publication of periodicals and newspapers by abolishing licensing conditions in force prior to the revolution. Tunisia’s democratic transition brought justice to the SNJT, as Tunisian journalists, voted by an overwhelming majority to endorse their previously ousted/sidelined bureau. The SNJT was one of the first Tunisian syndicates to hold its general congress after the revolution, on June 4 and 5, 2011. The SNJT bureau was able to work out a formula to appropriately position the syndicate on the union and political field. The key was the concept of independence, while affirming in every stance the syndicate took that it was a core part of the political battle for liberties in Tunisia. In truth, the political prominence of the SNJT came in response to the new spirit alive in post-revolution Tunisia, where civil society organizations and syndicates, especially the Tunisian General Labor Union (UGTT), played a central role in the success of the Tunisian transition. It was due to the special part played by Tunisian trade unions and civil society that Tunisia was awarded the Nobel Peace Prize in 2015. In the early years of the revolution, the SNJT waged a battle for a free, pluralistic society shoulder-to-shoulder with all of civil society. After the Islamists and their allies assumed power in the wake of the October 2011 elections, government-friendly media appointment and attempts to contain the media grew more frequent. The government appointed several figures politically and ideologically aligned with it to preside over public media organs and installed loyalists to head some confiscated media outlets like the daily Assabah, Shams FM, and public television (Channels 1 and 2), “absent genuine standards or competence,” according to statements from the SNJT. The syndicate met the assault of the government and its supporters with an equally forceful response, as Tunisian journalists, led by the SNJT, staged more and more protests. The resistance and response to the assault on media independence culminated in two general strikes by the SNJT, the first in the country’s history. Bringing the media to a standstill, the strikes embarrassed the government and spurred it to rethink several actions it had taken. The SNJT-led protests and strikes remapped the media landscape, persuading the government that there was no choice but to engage with the syndicate and accept its role as a collective professional guarantor of free, independent media in Tunisia. The SNJT emerged from the battle for independence victorious, while recognizing that any such victory for independence and media freedom is by nature transitory, requiring ongoing efforts regardless of the government in power. Emboldened nevertheless, the syndicate realized another decisive battle lay ahead, no less significant than the struggle for independence and press freedom: the battle to transform the SNJT into an institution with a stable administrative structure, elected bodies, and a model of good governance that would enable it to manage the union internally. Absent this, the syndicate could not hope to successfully meet external challenges. An administrative structure capable of steady operation amid the regular rotation of members elected in syndicate congresses was the fulcrum on which the process of SNJT’s internal governance and institutionalization rests. Those active in the syndicate after the revolution understood that the lack of such a structure was a weakness in union and associational work. The resolute support offered by external international organisations such as International Media Support by way of Danish Arab Partnership Programme funding, provided the SNJT with operational and structural guidance. IMS helped build a solid foundation and backing that allowed SNJT to maximise its potential in a strategic manner and enabled it to operate independently free from constraints that included financial pressures. The syndicate’s new operating framework was endorsed by a majority of Tunisian journalists, but for some, this new model of governance and institutionalization must be comprehensive, relying on objective standards when it comes to certain decisions. In addition to governance and decision-making within the syndicate, some journalists had other criticism, most crucially the SNJT’s retreat from its political role, which had reached a peak in the early years of the revolution. “The day of rage,” organised by the syndicate’s current bureau on February 2, 2018 to protest repeated security assaults on journalists, is cited as evidence by the bureau that there is no conflict between, on one hand, the realization of social demands and the defense of liberties and, on the other, criticism of the authorities’ treatment of journalists. Outside the media sector, feminist activist Yousra Fraous finds some fault with the journalists’ syndicate for not adequately engaging in battles for civil and individual liberties. She says that the SNJT’s stances on some issues involving the violation of such rights are “wan,” noting that freedom of expression is a universal principle. This criticism is debated within civil society, for a focus on associational work and a dedication to a specific area lies at the heart of any organization’s role, though this does not preclude coordination and complementarity. Despite these criticisms, nearly everyone believes that the SNJT is undergoing a significant, multidimensional transformation that will entrench it as a strong, independent professional organisation that acts to defend media freedom and social and professional rights of journalists. 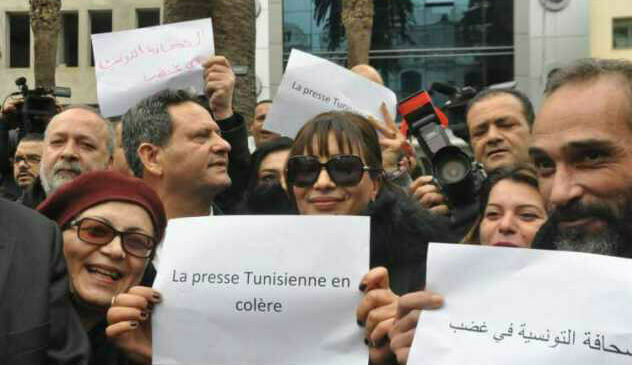 Already it is clear that the journalists’ syndicate in Tunisia has gone beyond merely influencing the media sector to directly contributing to the country’s successful democratisation. Given this singular experience, it can be seen as an example worthy of emulation and a model to be exported to the rest of the Arab region.